Where are the jobs? Find a vacancy? Need help with applications? Looking for experience? We know that finding work is a challenge at the moment. The world of work is changing and will continue to change very rapidly. 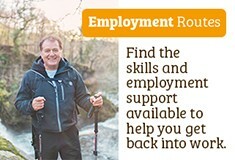 We have some tips and information to help you with job seeking. How many people are employed in the job area I am interested in? Where are the vacancies? Are there opportunities where I live? Simply type in the job you are looking for and we have information that will help you. Will there be opportunities in the job I am interested in in the future? We have a series of ‘Job trends’ information sections that will help you find out what the prospects are. Do you need to stay local? We have some advice on finding out what is available where you live. Find out for yourself. Take a chance. Talk to people about how they got their job. Many people end up taking different jobs and getting all sorts of experience before settling into a career. Be prepared to try something out even if it is not exactly what you want. Any experience of work is valuable and will improve your chances in the future. Network. Many, many vacancies are never advertised. Have a look at our advice on networking.